I read this article and found it very interesting, thought it might be something for you. The article is called La Tomatina de Buñol once again and is located at http://www.nest-hostels.com/la-tomatina-de-bunol-once-again-2/. One more year the town of Buñol helds one of the most known festivals around the world: La Tomatina. If you have been to Valencia, you might have heard about this party. But, what do you know about La Tomatina? Origin. There are several theories about the origin of La Tomatina all of which place the birth of this festival in the early 1940s. One version states that a group of young boys began to throw tomatoes at a man who was terrible playing and singing at the town square, hence the launch party tomatoes. Another version states that La Tomatina comes from Cipotegato a festival that takes place in Tarazona, in the province of Zaragoza. In this festival the crowd throws tomatoes at a person dressed in a Harlequin costume. Probably the most accepted version is the one that places the birth of the festival in 1945. During a party in the village, participants of the parade took tomatoes from a market stall and started a battle against part of the spectators. However, it was not until 1950 that the first official Tomatina is held, being banned some years later to be back again in 1959. Duration. The battle itself last about an hour during which approximately 140.000 kilos of tomatoes are thrown. Tomatoes. Tomatoes used in La Tomatina come from Chilches, a small town in Castellón. The quality of these tomatoes is very poor, and they aren’t tasty, therefore they are specifically grown for La Tomatina. What to wear. Old and comfortable clothes that can be thrown away after the festival are highly recommended. A swimsuit to wear underneath could save us if things get too wild. It is essential to have swimming goggles to avoid eye injuries. Shoes should be closed-toe shoes, get rid of your flip-flops. Success. La Tomatina has become so famous that in 2002 was declared Festival of International Tourist Interest in Spain. The festival is so crowded with people from all over the world that, since 2013 tickets are needed to access and take part in the tomato fight. Tomatina in other places. The success of La Tomatina worldwide has been so amazing that other cities in the world are trying to reproduce this festival and reach its fame, but they haven’t yet. Places in Colombia, Costa Rica, Chile and China are some of them. Afterparty. 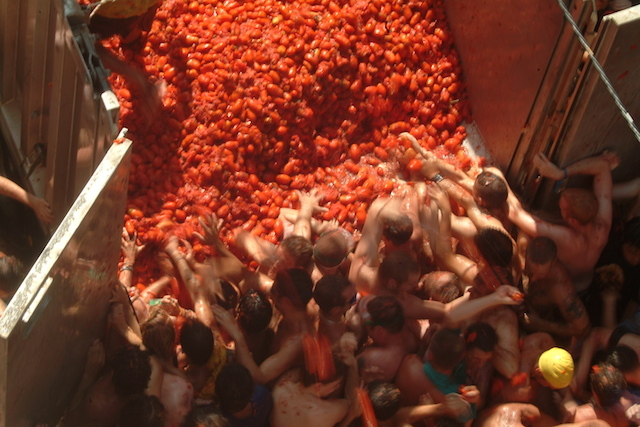 Lately La Tomatina has not only increased interest because of the battle itself but in the different afterparties held. Our hostels in Valencia, the Purple Nest and the Red Nest have great afterparties so you can enjoy La Tomatina all day long. Come and join us!